I've recently returned home from a truly memorable trip to Germany, Iceland, Spain and Italy, where I had the pleasure of promoting Burial Rites in translation. To my extraordinary publishers - Droemer Knaur, Forlagið, Alba Editorial and Edizioni Piemme - thank you for welcoming me to your cities, your offices, and your in-house cats (I'm looking at you Forlagið), and for your tireless work in bringing this story to new audiences. To my brilliant dugleg translators - Leonie von Reppert-Bismarck and Thomas Rütten, Jón St. Kristjánsson, Laura Vidal and Velia Februari - it was such a pleasure to meet so many of you. To the people who came to listen to Nicolette Krebitz read from Das Seelenhaus in Munich, Berlin and Wiesbaden, the audience members at Pordenonelegge Literature Festival, the book club of Rafael Alberti, and the kind, generous Icelanders who made me feel so welcome at Cafe Rosenberg in Reykjavík - your interest and support meant so very much to me. Thank you. 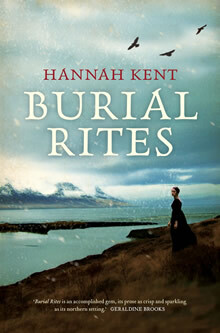 To celebrate the release of Burial Rites in various translations throughout 2014, I will soon be giving away some copies of the novel in German, Turkish, Dutch, French, Danish, Hebrew, Spanish, Mandarin, and Portuguese, as well as some copies of Burial Rites English and in audiobook form. Stay posted! With Droemer's Hanna Pfaffenwimmer, and Christian Dunker from Autorenbuchhandlung in Berlin, Germany. With chair Knut Elstermann and German reader Nicolette Krebitz at Autorenbuchhandlung in Berlin. Burial Rites Icelandic translation: Náðarstund. Signing copies of Náðarstund at Forlagið. Viewing the axe and block used in Agnes Magnúsdóttir's execution. These items are held in the Þjóðminjasafn in Reykjavík. Meeting Nói, the Forlagið office cat. With the wonderful Jón St Kristjánsson, the Icelandic translator. Reading at Café Rosenberg in Reykjavík, Iceland. With Spanish translator Laura Vidal, and editor Maria Tenas. In Madrid for a reading at Libreria Rafael Alberti. With Giulia De Biase, Fiction Editor at Piemme, Arianna Malacrida, Briony Kent, Alessandro and Italian translator Velia Februari in Pordenone, Italy.